As directed by the Academy board, mandatory chapel service was considered essential to development of moral leadership for cadets. 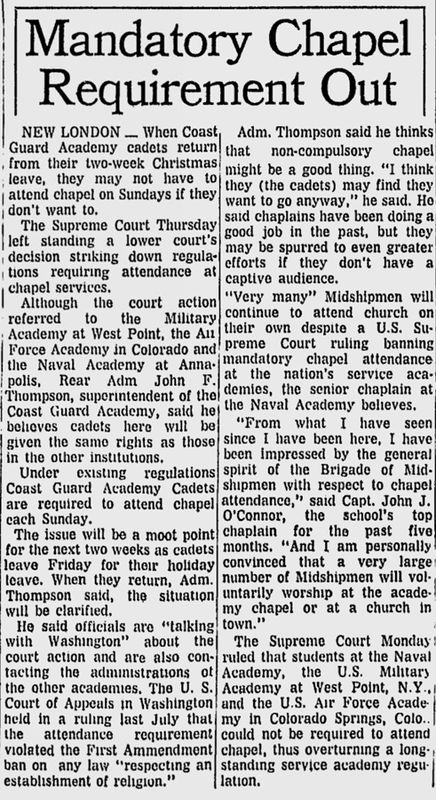 Attendance at weekly Sabbath/Sunday Chapel or church services of the cadet’s choice was mandatory for all cadets except First Classmen. Second, third, and Fourth Classmen had the option of attending services at the Cadet Chapel, the Community Center Chapel, or at any house of worship on the Command Chaplain’s list of “on limits” churches in the Pikes Peak Region. On 30 June 1972, the U. S. Court of Appeals ended 150 years of military tradition when it ruled that compulsory chapel attendance at the three United States service academies was unconstitutional. The suit was originally brought early in 1969 by the American Civil Liberties Union on behalf of all the cadets and midshipmen at the service academies. The Solicitor General appealed the case to the U. S. Supreme Court, which would eventually determine whether the case should be heard by that body. 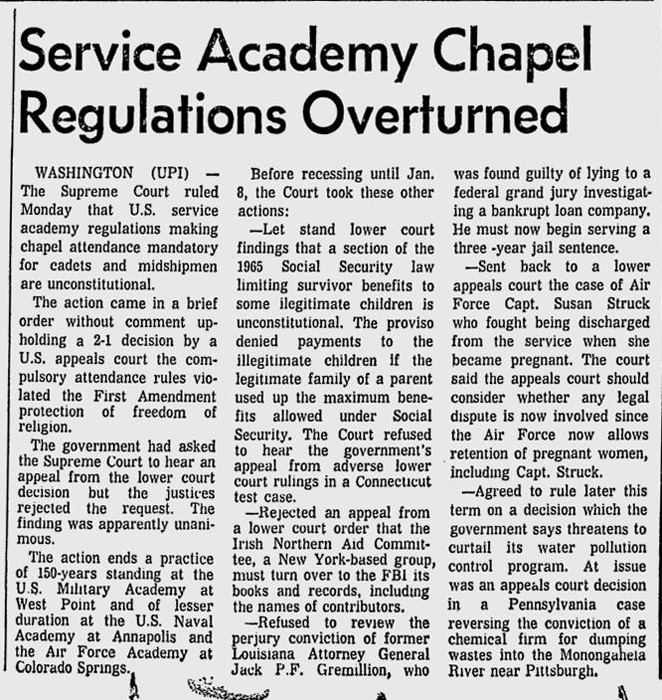 As noted in previous histories, the service academies' mandatory chapel service had been challenged in the courts. In a petition filed with the U. S. Supreme Court, the Defense and Justice Departments asked the court "to uphold compulsory chapel services at the Army, Navy and Air Force Academies as essential for instilling 'awareness of our moral and religious heritage' in the military commanders of the future. A divided lower court had ruled previously, on 30 June 1972, that "compelling church attendance was as much a violation of the First Amendment as indoctrinating servicemen with religious precepts." In the petition seeking reversal, Solicitor Erwin N. Griswold denied that "forced chapel attendance was an unconstitutional 'establishment of religion,'" and stated that "the chapel services were primarily educational and were authorized under the power to regulate the nation's military forces." On 18 December the long controversy came to an abrupt end when the Supreme Court in a brief order without comment upheld the decision of the U. S. Court of Appeals for the District of Columbia. By refusing to review the appeals court decision, the Supreme Court ended a practice of over 150 years standing that began at West Point. In reply to a query as to the Academy's reaction to the Supreme Court's dismissal of the government's appeal upholding mandatory chapel attendance, General Clark stated: "The Air Force Academy will promptly respond to the decision of the courts. In view of the current chapel policy this development will impose no traumatic change in current cadet activities..."
Effective upon their return from Christmas leave, all cadets were free to decide whether they would attend religious services. Statistics indicated a drop in attendance of approximately one-third at formal chapel services. Participation in other informal meetings and religious activities remained unchanged.